you may find it beneficial to go together to purchase finishes by the gallon and share them. StopLossBags® are available with your choice of filling methods. The StopLossBag® Collapsible Funnel is a great way to easily transfer finish from a quart or liter can directly into the StopLossBag®. The Filler & Adapter Tube Set attaches to the spout of the StopLossBag® and allows you to use a variety of normal funnels. The use of a “StopLossBag® Filling Station” helps ease the transfer of liquids. You may change quantity during checkout. The StopLossBag® Collapsible Funnel is formulated to stretch over an opened quart or liter can while the spout of the StopLossBag® fits the small end of the funnel. Easy to use, easy to clean. 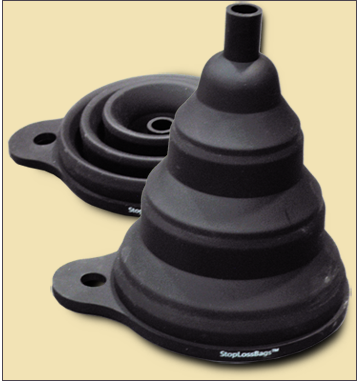 Strainers help remove dust and other physical impurities from liquids. Strainers are generally available in paint and hardware stores, but are intended for general use which includes latex paint, and therefore have a relatively open screen size of 190 microns. Our strainers have a mesh size of 125 microns, suitable for wood finishes and remove all but the smallest of impurities. Made in USA. Straining will improve your results and allow you to extend the useful life of your finishes. When should you use strainers? 1. Finish being returned to a StopLossBagTM should always be strained. 2. If jelled finish is found in the neck of a StopLossBagTM, the contents should be strained whenever dispensing. 3. When flushing a just-completed bag with solvent, the solvent should be strained on emptying the bag. The bag should be flushed several times. The strainer can likely be reused while still wet. 4. When any debris or floating jelled finish is seen in the finish inside the StopLossBagTM it should be strained as it is dispensed. Great to have on hand, cheap insurance. Also, as you are using the bags drips can cling to the edge of a cap and over time build up external residue. Having extra caps lets you put on a fresh cap, allowing you to set the original aside so the finish hardens and can make it easier to clean. DIY Filling Station. The set is not required for use with the StopLossBag® Collapsible Funnel. We wish you well on your woodworking projects and hope you find the StopLossBag® to be a positive addition to your woodworking projects by reducing waste, giving you better results, and saving you money.